Cam came over early this afternoon to help on some more progress on the benchwork for the layout. Primarily woodwork surrounding the shelf brackets on the end-wall where ICG in Nanaimo, the Trent river bridge, and the entry into Port Alberni. 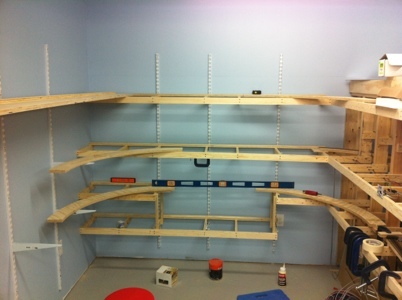 And with that work, I’m now pretty much out of my 2″ strips of 3/4″ plywood. Now I really am needing virtually everything! This entry was posted on July 23, 2012. It was filed under Benchwork.